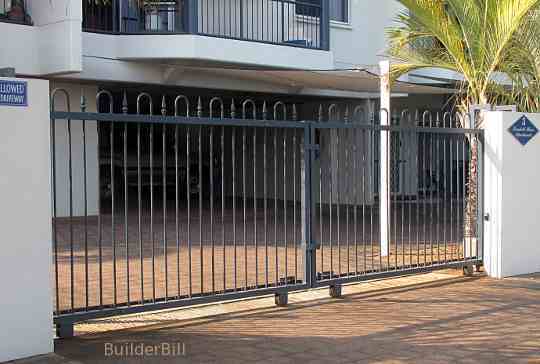 An electric powered mechanical device for opening and closing gates. A post at the side of a gate that is used to support it or the aid in securing it. The gates above are to a small complex of apprtments. The gates are activated directly from a resident's car by a small electronic sender. 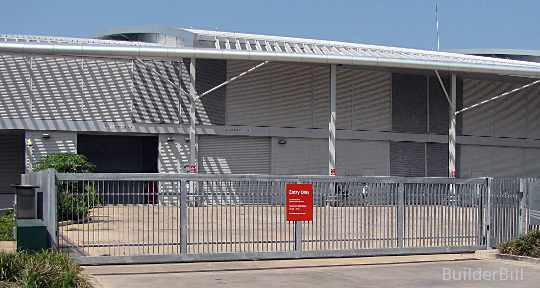 Both gates roll sideways on a steel track set into the concrete at the same time. The mechanical method is by rack and pinion, see below. 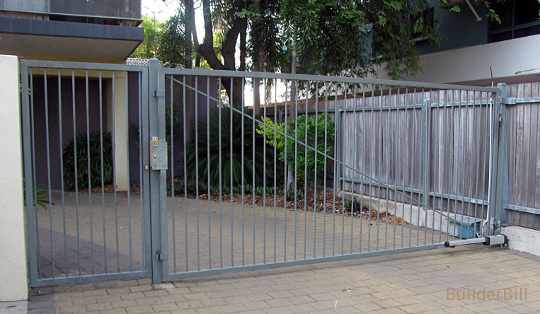 Gate Operators: A single heavy steel gate. What you are looking at above is a steel gate that is about 12 metres wide. It is running on a track set into the concrete and heavy duty steel bottom rollers. 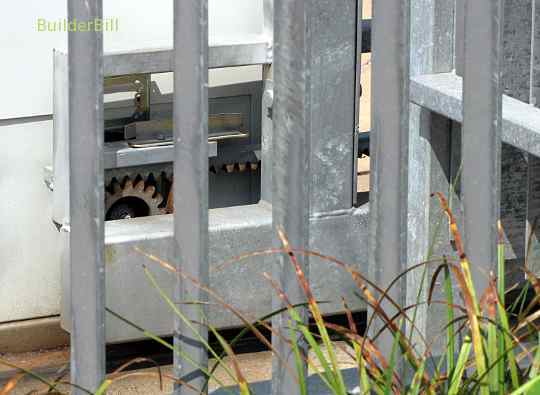 Gate Operators: A rack and pinion used to open a sliding gate. So this is the method used to move a lot of heavy gates. It uses a simple application of the engineering rack and pinion which is seen on many devices from automobile steering to cd trays.. The rack is a stright steel bar that has the saw tooth cogs. The pinion is the small cog wheel that is fixed to the shaft of an electric motor and it engages the rack. When security press a button the motor fires up and the gate glides open. Once again an excellent demonstration of how sliding doors or gates can save space. Gate Opener: A swinging ate opener. This lightweight steel gate swings off it's right hand gate post. The opener is a small hydraulic system that when it is activated it opens and closes the gate with a small hydraulic piston and ram.